Since the presence of planets around other stars was demonstrated, that natural processes under adequate conditions appear to be able to generate life and that life generally evolves in the direction of an increasing complexity, it seems natural to imagine that there is are certain number of intelligent civilizations around other stars. If such extraterrestrial civilizations do exist, what is the best way of discovering them or to communicate with them? To send a spaceship or a probe would require a gigantic time and energy due to the enormous distances. In fact, the nearest star to the solar system, Proxima Centauri, is at a distance of 4,3 light-years, that is to say 41 thousands of billion kilometers. Getting there would take 40,000 years for a probe equipped with the current technology. Even for a very advanced civilization, the energy cost of a faster travel would be enormous. 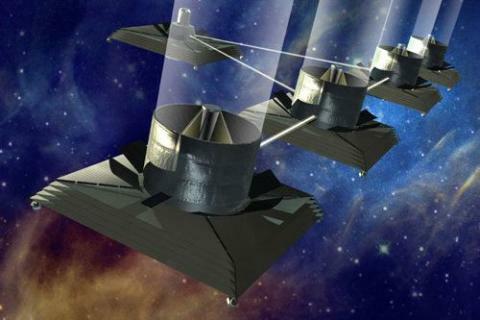 Moreover, as we do not know where to search, sending multitude probes would be necessary, which would multiply the costs. The best solution, in the current state of our knowledge, consists in resorting to electromagnetic waves in the radio field. The goal being to intercept a message which would be intentionally sent to us by another civilization, that is to say to intercept some of their internal transmissions, just like other civilizations could theorically intercept our radio, televiosion or satellite communications. 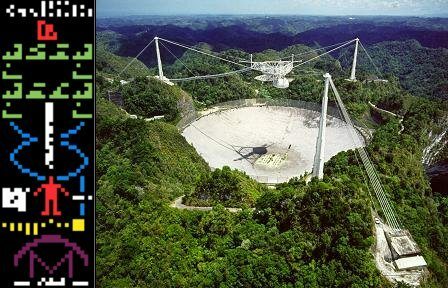 The radiotelescope of Arecibo is located in Puerto Rico. 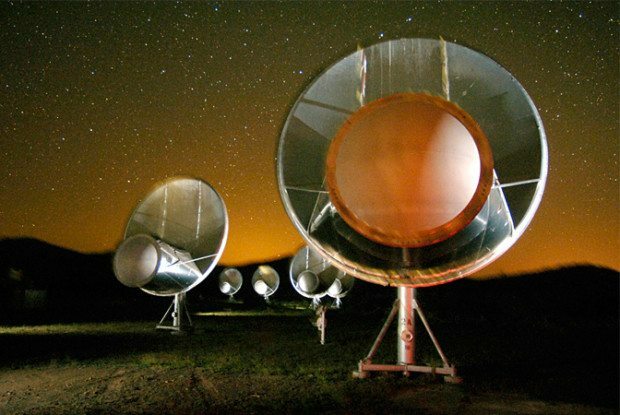 Several detection extraterrestrial signals projects are operating. The 300m antenna was built in 1963 in a natural cavity. Radio waves have many advantages. First, they move at the speed of the light. It takes them only 4,3 years to reach Proxima Centauri. Secondly, they are easy to generate or receive, and that at a low cost. Lastly, they are not disturbed by the galactic magnetic field and, for a wide range of frequencies, absorption or diffusion is very weak. The disadvantage of radio waves is that certain fields of frequencies are very polluted by manmade objects such as satellites and by celestial bodies such as stars, pulsars, gas clouds, quasars and fossil radiation. This generalized pollution brings the radioastronomers who carry out this kind of research to consider only one small field of frequency ranging from 1 to 100 Gigahertz (microwaves). In this range reigns a relative calm, if not for the murmur of the fossil radiation. It is also possible to emit or receive signals at a low energy and a low financial cost. The large majority of extraterrestrial detection efforts are then conducted within this range of frequencies. One of principal listening programs to extraterrestrial signals is called Phoenix. This project was originally developed by NASA in 1992. It was stopped due to budgetary cuts by the American congress the following year. After this rough start, the program was picked up by a private organization, the SETI Institute. The project consists of a research targeting a range of frequencies between 1 and 3 Gigahertz with a very high resolution. The targets are a selection of thousand of stars located at a distance less than 200 light years. The majority of these stars are similar to the Sun as those seem to provide the best conditions for life development. Another important program is the project SERENDIP, which existed in various forms since 1979. It is its current phase, SERENDIP IV, in collaboration with the SETI@home experiment, which attracted the most interest. In this program, a secondary detector was installed on the Arecibo telescope. This detector observes the sky permanently. It then doesn’t need a specific time of observation, reducing the costs of the overall project. Another advantage is that in the long-term it will end up observing all the sky’s directions. This makes it complementary to other programs such as Phoenix which concentrates on a limited list of objects. Unfortunatly no nonterrestrial intelligent signal was collected. 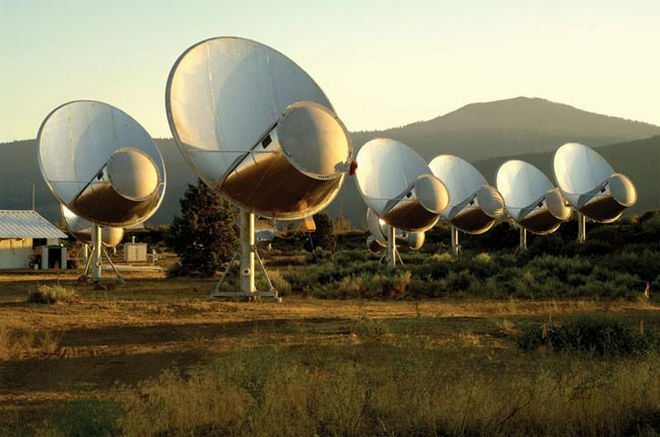 A current program is the Allen Telescope Array, a joint project between he University of California at Berkeley Radio Astronomy Lab and SETI. It will consist of 350 six meter diameter dishes. It will have a large field of view and will cost less than half a single radio telescope of similar collecting area. What do you think? Leave your thoughts below!